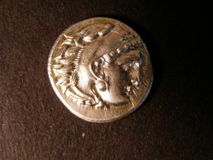 1722 Greece, Thasos, Dionysos on silver Tetradrachm, after 148BC. S.1759. small cut to obverse at nose otherwise VF. 702 Greece. 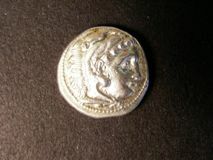 Thrace Apollonia Pontika silver Drachm. Obverse anchor. R. Gorgonian. SEAR 1655. Very fine, struck off centre.